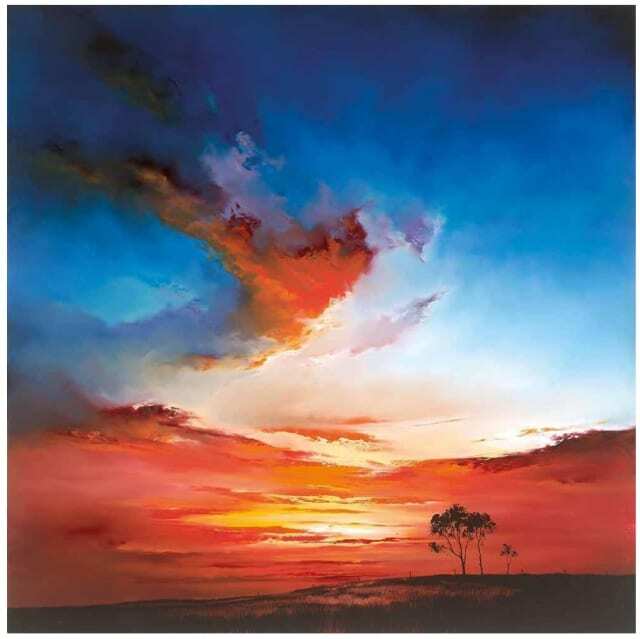 Richard Rowan uses his unique glass painting technique to create beautiful vistas of landscapes and skies. Inspired by his extensive travels worldwide, Rowan’s reference material contains anything from scenes of the Lake District to Hanoi. When back in the studio, he uses these images to transport himself back to these stunning locations and plan out a design to develop on glass. By applying oil paints directly onto the reverse side of the glass, Rowan is able to capture the serenity of a scene in a way that few other mediums allow. The layering of paint onto glass followed by patiently working into it with a variety of homemade tools, craft knives and even fingers are part of the painstaking process that goes into creating these enchanting pieces. To browse and buy his exquisite glass paintings online, please visit our Richard Rowan art page here. Contemporary landscape artist Richard Rowan first caught the eye of the art world when he won the Daily Mail’s ‘Artist of the Year’ award in 1992. But, despite winning the prestigious award, Rowan found it extremely difficult to establish himself as a professional artist. He abandoned the art industry and forayed into the world of motorsport, acquiring jobs in world rally and Formula 1 and travelling extensively for the next five years. Rowan was never completely out of touch with the art world. While travelling he would regularly sketch cars, motors and scenery, images that he would sell for extra cash on his intermittent visits home to Northamptonshire. But Rowan realised that the living out of a suitcase lifestyle was not for him. His focus soon returned to his long-standing dream of becoming a professional contemporary artist. Having had the opportunity to see so much of the world, Rowan’s whole outlook on life changed. He had new cultures, experiences and emotions to convey, and had been exposed to some of the most beautiful landscapes and phenomenons on the planet. Leaving his fast-paced lifestyle behind, he channelled these inspirations into his work, devoting much of his time to perfecting oil painting on his preferred medium of glass. Rowan developed a particular interest in the ethereal nature of landscapes and skies. Both subjects are constantly in a state of flux, exuding a constant flow of inspiration which Rowan enjoys exploring and capturing in a moment in time. In comparison to traditional canvas painting, Rowan’s glass painting process is done back to front. He paints the foreground first, allowing this section of paint to dry for up to a week before applying more layers, eventually finishing with the hues that make up the landscape’s backdrop. Rowan’s compositions draw the viewer’s eye to the centre of the works where light is usually focused. Strategically placing white card behind the glass allows the light to reflect back, thus illuminating the image and giving it a delicate and organic feel.